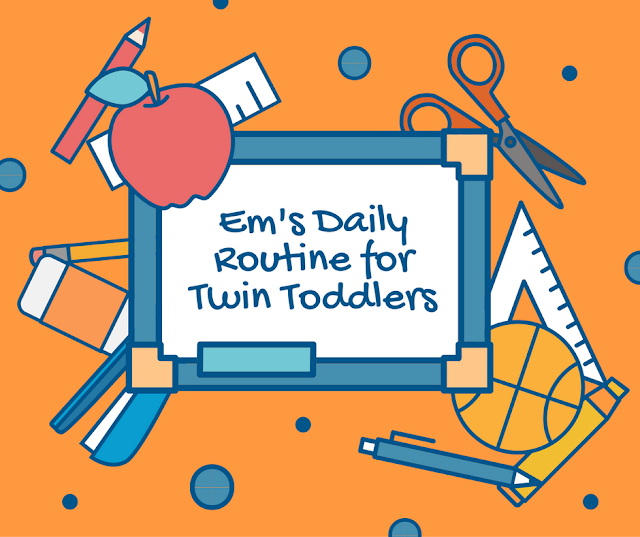 Last week I promised to share a typical day in the life of twin-mommyhood. Granted, this routine is soon going to be rocked to its core with the introduction of a new baby brother...but there is nothing I can do about that but keep on keepin' on. 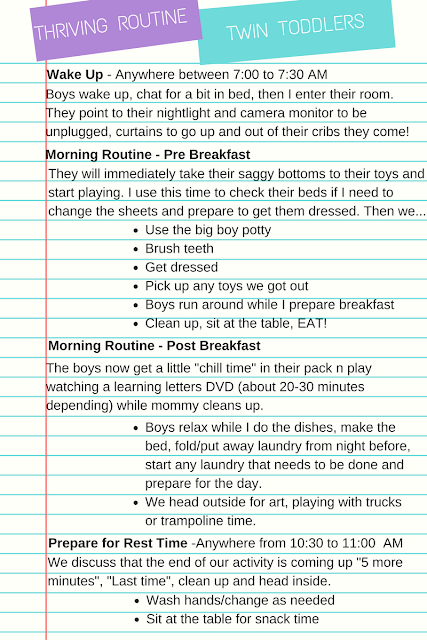 Over the two years my boys have been alive I have taken my love of routine/schedules and applied it to raising them. As I mentioned before it isn't realistic to think you can schedule a baby, but as the child grows and falls into natural sleep/eat patterns, this method becomes easier to implement. My guys wake up around the same time everyday making our routine easy to follow. Granted, there are always those random days where they are up early or sleep in late (bless those sleep in days), but those are far and few between. For the most part they, like their mommy, are creatures of habit...and I love it! So here is a little sample of our day. While I reference the major changes when Daddy is home (remember a firefighter's wife is often alone) my own Thriving Mommy, the great and powerful Maj is nearly always available to help me as needed. 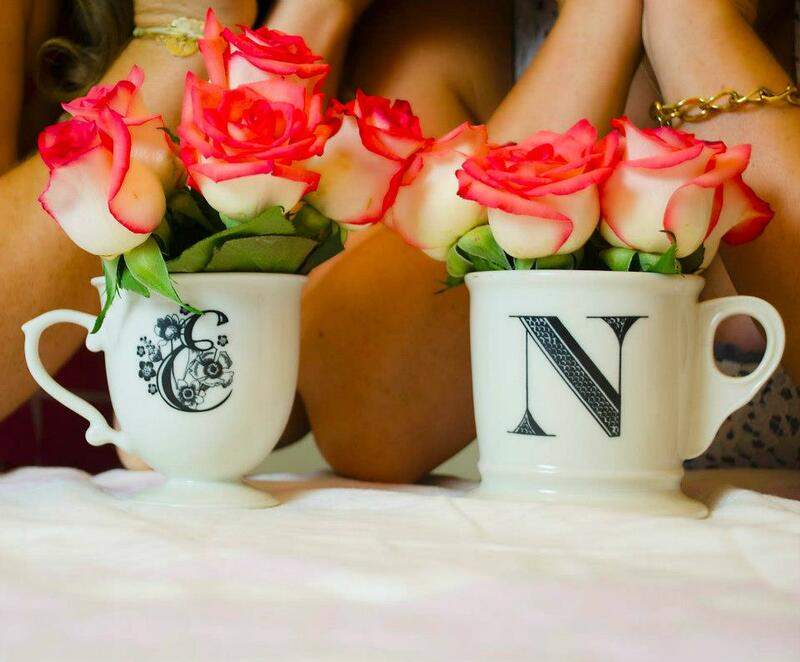 Of course a HUGE thank you to both of them who do their best to stick to the routine...especially rest and bedtime! WHEW! Seems like a lot right? Well, let me tell you, the day FLIES by! They are so good at knowing what to do I am often amazed at what my two year olds are capable of. I won't pretend that every transition is a smooth one or that they don't get great pleasure from escaping the bathroom and running around naked, but overall, they know what is going on and THRIVE! 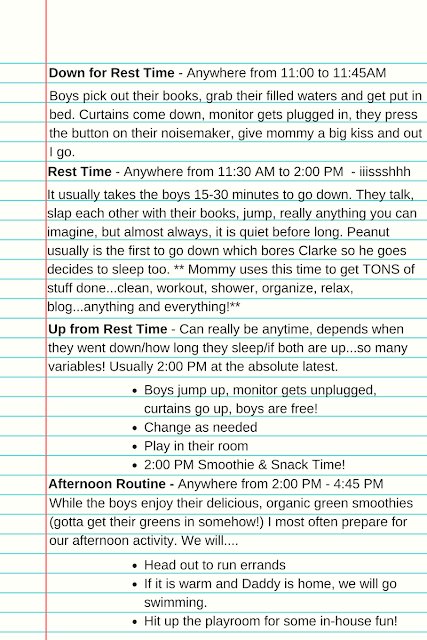 As for what to do each day, here is a little "menu" of activities that I rotate through. A lot depends on how we all are feeling (obvi, big preggo mommy isn't super full of her usual energy wrangling two little boys), who is home to help (Daddy or Maj) and what needs to get done (ie, grocery shopping, returns, ect). What does your day look like? Are you a lucky stroller pushin' suburban mommy with a plan or a carefree "seat of your pants" kind of gal? 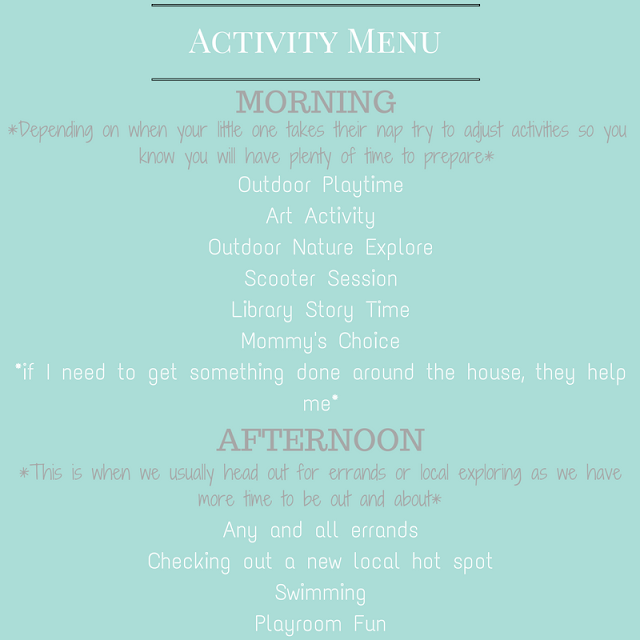 Please share your go-to activities to add to our menu!